Escape from NOM sounds a bit like a John Carpenter film starring “Snack” Plissken and his adorable posse of badass LOLCATS. The reality is about as odd but a whole lot more cute (and FREE!). This unusually-named puzzle game stars a friendly looking ball named Alan who is attempting to avoid being devoured by the charmingly stupid-looking NOMs. Each of his daring escapes require cunning, courage, and color vision in a normal range. Gameplay is a bit like Peggle and Sushi Cat, with a strong Dropple flair as gravity and physics are the main stars of the show. You must carefully arrange Alan at the top of the screen so that he can drop into the pool of colored water at the bottom. Color is very important in the game, as NOMs will try to eat Alan if he is a different color than them, and Alan will not be able to drop into the colored water unless he matches. This means you will likely need to bounce Alan off of various color-changing nodes to help him sneak past the NOMs and make a big splash at the end. Some of the levels have various special items to help you along the way. These can either come pre-set in the level or sometimes you can place them yourself. There will be various paddles for Alan to bounce off of or devices that let Alan teleport around the screen. These tools are an essential part to this frequently challenging game, and as you play through, you may decide to try for the gold and silver medal finishes, which requires collecting the bonus point flowers and a lot more concentrated effort. Escape from NOM is an exceptionally cute game with a fun puzzle premise. I was actually really surprised and pleased with how beautifully the game performed, considering the free price tag, and while the ad placement can be mildly annoying at times, in general, they didn’t interfere with my enjoyment of the game. Level difficult ramps up quickly, and there are a decent number of levels to work through in five different worlds. 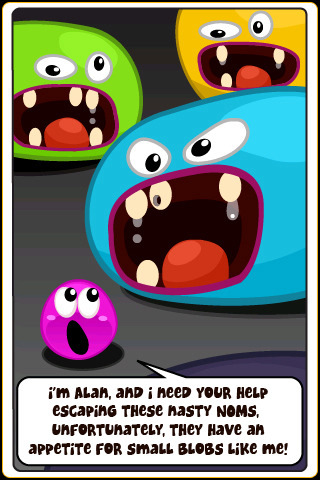 Also, Alan and the NOMs ooze an enormous amount of personality for the simplistic blobs that they are, and although the graphics are basic, they are colorful and engaging enough to hold your attention. Although it’s not particularly deep, it does provide a fair bit of cutely animated mental stimulation for zero cents, which makes this a well-worth a try for those of you looking for app entertainment on a tight budget. 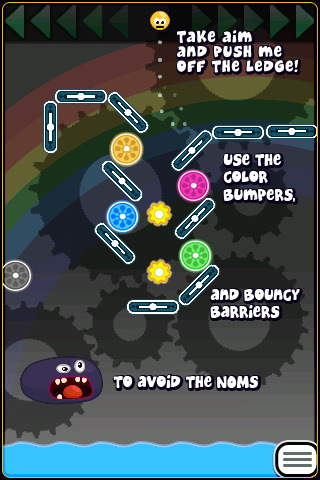 AppSafari review of Escape from NOM was written by Tracy Yonemoto on October 8th, 2010 and categorized under Action, App Store, Games, Physics Based, Puzzler, Strategy. Page viewed 2522 times, 2 so far today. Need help on using these apps? Please read the Help Page.